PAX Aus was a whirlwind. 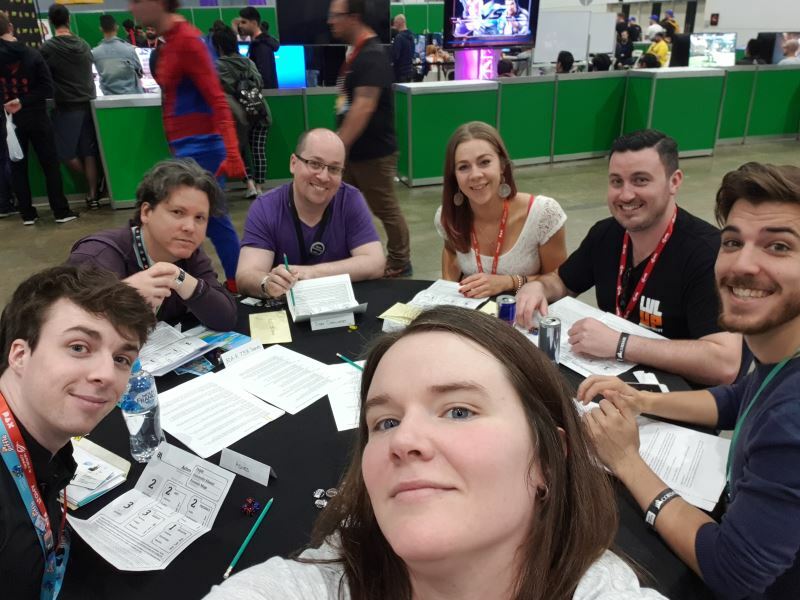 From one day to the next, I was taking care of press for a client, showing Breakaway, meeting new people and reconnecting with old friends – and I even managed to get on a panel about GMing. The panel was named I’m a GM, and So Can You. The quality of people on the panel with me was immense, and I felt grateful to be there. 24 people came through to see us at PAX Collaboratory. For an RPG that takes at least an hour, that’s a pretty big deal! I also had my own session times wrong (I missed out on an extra two hours of playtime! ), but I am ecstatic I had any time at all. People were so kind to listen to our spiel, let alone set aside an hour of their time to play. The game didn’t slow down with two Charter Authorities (like a GM or Storyteller). If someone walked up to introduce themselves (I met my artist, Josh! ), Zac was able to take over smoothly and by the end we were describing situations together. That makes me wonder if there should be a mechanic involved that allows for multiple Charter Authorities. Zac and I both seemed to be having a lot of fun with players and their creative use of abilities and spells. Some people even started making up their own spells on the fly – which we greatly encouraged. Hearing what people wanted to do and how they wanted to work together to get the most out of their abilities was really a humbling experience. Here’s Zac setting up the display before players came by! The player packs went over very well. Several people remarked that opening one felt like Christmas – there may have been too many goodies inside. 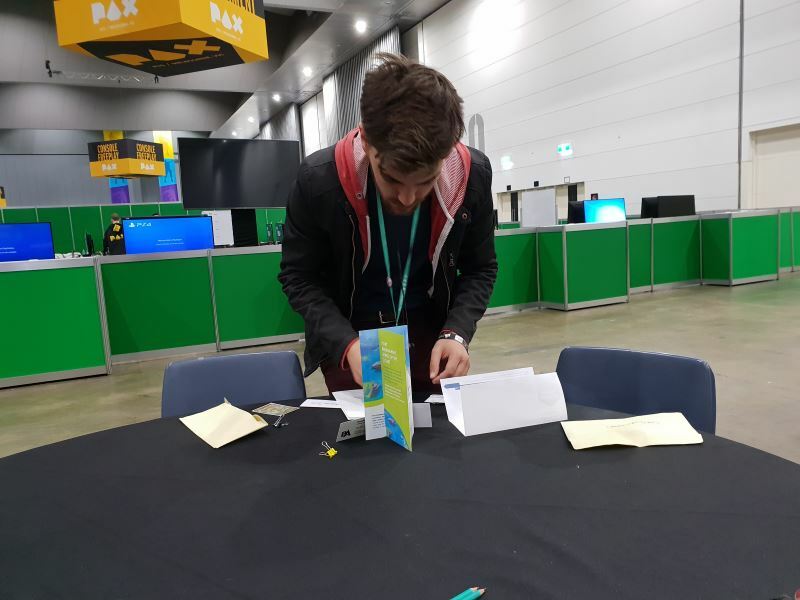 They created some clutter on the table, but I think that could be alleviated by giving players something better to hold items in – and not just a well-stuffed envelope. The one-shot adventure had to be very, very tight with a maximum playtime of an hour and a half. I narrowed my scope to a mystery with 3 clues, 1 non-player character (NPC), and 1 combat round. 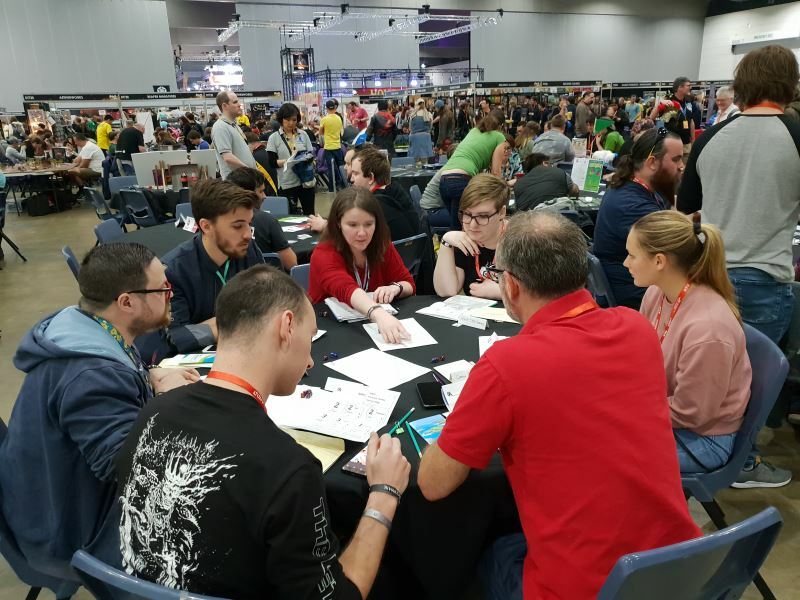 This gave me a chance to test the dice system, see how players felt about rolling, how abilities were used, and how the pre-generated characters were perceived. Player feedback for dice, after you wrapped your head around it, felt natural and fun. The characters were interesting (Crabernathy Jones was a huge hit!) and people seemed to have very little issue connecting with their non-humanoid characters. 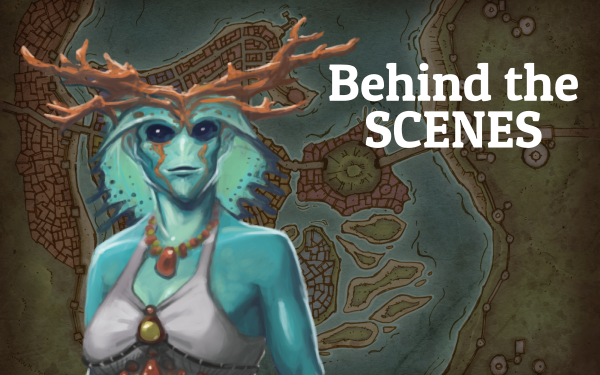 One of the fears around character design is that people will not connect with creatures that don’t have faces – the idea is that we naturally put people who do not look like us into the “monster” category. I’m looking to test those waters, since I’m dreadfully tired of Elves, Dwarves, Orcs, and – most of all – Humans. Blech. Check out our smiling faces. So cherubic! I will likely next year (cross fingers) bring feedback forms with me, instead of just popping my business card into the envelope. Putting in a business card just creates one more step for people to do before they can give me extra feedback, whereas a feedback form will help answer questions that I have immediately. (A business card in the pack probably doesn't hurt, but it doesn't actively help me either.) I also should have been shaking hands more with the people next to me - being in Collaboratory was so last-minute that I rushed to be a part of a community that I thought I had more time to approach. Believe it or not, I'm actually quite shy when it comes to meeting people outside of my day job. Be that as it may, the time I did get at the table with eyes on Breakaway was a fun learning experience - and a huge opportunity that I'm especially grateful for.